Secrets of the Spiritual Kingdom is available at: Barnes & Noble, Author House, Amazon, on Kindle, or at your local bookstore. 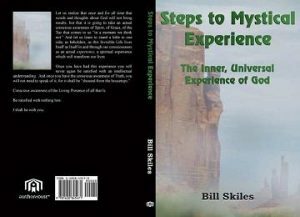 Steps To Mystical Experience is available at: Barnes & Noble, Author House, Amazon, on Kindle, or at your local bookstore. The whole secret to having that healing Christ Consciousness is in the attainment or in the ability to have a relaxed mind, to meet any problem, any storm, within, with a relaxed mind. Any storm presented to your consciousness—with that relaxed mind—is meeting it with the Christ that says, “Peace, be still,” and then there is a great calm. Do we not see the principle here? What is it that dissolves the storm? It is the Christ saying, “Peace, be still.” It is the Christ saying, “It is I, I am Omnipresent. You are looking at I, be not afraid.” And then the goal is attained, a great calm follows. One of the best examples I have is the story that I call, “Two Dogs Barking.” I’m going to repeat it even though I’ve said it in the past because it points out to me this principle of a relaxed mind. And so I got as quiet as I could in spite of the racket and they were really going at it. I expected to hear the high pitched little dog crying and running off. And I’m meditating and they’re barking. I’m meditating and they’re shrieking. I’m meditating and they’re really going at it. Suddenly the little scripture came to me, “Not by might” and I relaxed my body. “Nor by power,” and I relaxed my mind. “But by My Spirit.” And I said within myself, “Wait a minute. I can’t use God. Now God, you use me.” I relaxed my entire being and I suddenly felt flooded with the Presence. And there was a great calm because Christ had said, “It is I, be not afraid. My Presence is here.” And there was a great calm. I stayed in that calm for a few minutes and, when I opened my eyes I thought; “Hey, what happened to those dogs?” Because there was a silence outside, that storm was not outside; it was within consciousness, and as I reached that great calm, well, that is where I was living – in that calm. I even opened the door and looked out, and listened – nothing: total calm. Now, either those dogs became friends and walked down the road wagging their tails, side by side, or they simply walked away in different directions, but nothing happened. The storm ceased and there was a great calm; as within so without, because without is really within. We understand Saint Thomas, in the Book of Thomas, when he says that Christ said, “The outside must become the inside and the inside the outside,” don’t we? There was a great calm, as within, so without. And I realized, and am realizing even today, that the answer to any storm—any storm—is to meet it with a relaxed state of being, to meet it with no power whatsoever. No resistance. No fear. No anger. No physical might, no mental thoughts, no mental power, and no mental statements. We do not calm the storm by any effort – physical or mental. We calm the storm by becoming still, by having a relaxed mind. And in that relaxed mind, Christ asserts Itself and says to the storm within, “Peace, be still,” and there follows a great calm. Or Christ appears and says “It is I, be not afraid,” or “Have no fear, it is I.” And immediately the goal is attained. And the goal is a great calm. Don’t be afraid for a season to put aside all books, even this one, to come to God empty handed, with a clean slate, to let God reveal God to you. Go within, become still and be receptive to God’s wisdom instead of man’s thoughts. Refuse to borrow from anyone’s thoughts about God. This is the Way. When it happened to me, it was disconcerting for a time. There was the feeling “They have taken my Lord away.” But it really wasn’t the Lord at all, only dozens of borrowed, worn out powerless concepts. I had to go within, and sit, and sit, and wait. And sometimes I felt nothing. I would go about my business, and then return at night or the next day to meditate again. Eventually something began to stir within me. There was a quickening. The Spirit of God Itself began to make Itself known to me as an experience. But this God experience, this mystical experience, was alive and had power to heal, and no man could take it from me. Neither was there any need to prove it to anyone. There was a natural tendency to keep it secret and sacred so that it could grow, rather than have discussions about it. Once we have had this experience, it will come again and again until we have our own understanding, our own knowing of what God is. And it will lead us to the right scripture or the right book which will corroborate our experience. How will we know it is a real experience? By the most practical test of all: Does it work? What are the results? You see, we reach the place where every meditation has to be an experience of God because we know that no knowledge of God will heal or bless or be a benediction. And yet, after we have the actual visit of God, or Spirit, or Christ, or Spiritual Realty, come upon us, we will see an Invisible Presence that really does go before us to prepare a place for us. Sometimes it can appear as just the right parking space at just the right time. It can appear as the right book, the right class, the right opportunity, usually one we never thought of ourselves. Then we will be done with concepts, many of which we may have carried for years. Like old friends, we let them go. They may even have sustained us for a time while we were moving toward the experience But go they must, no matter how dear they seem; if we are ever going to have a mystical experience. It isn’t the explanation of the experience; it is this experience of God that heals. We will learn eventually that all we need do is rest in the Silence until we feel a movement within that signals to us that we have had a spiritual experience. Sometimes these experiences will be profound, sometimes just a quick shift within. However, we must abandon all concepts of God in order for the experience to come to us. But let us not stop with concepts of God. Let us go the full route and abandon our other concepts as well: our concepts of good and evil, our concepts of woman and man, our concepts of health and wealth, lack and limitation. Let us abandon our concepts of this world and the spiritual kingdom. Let us go to God Itself and let God reveal the truth behind all of these concepts. We can even ask what does Christ mean? What does Spirit mean? We can go within and ask for light on any topic for which we formerly had a concept; Grace, truth, peace, Light, abundance, life, anything we want. This is how this book came into being. I went within, I asked for clarification on these topics, I became quiet and I listened: “Speak Lord, thy servant heareth”, was my attitude. Then as these truths poured out, I simply wrote them down or dictated what I heard.